The 2009 Midwest Birding Symposium in Lakeside, OH was simply phenomenal. Now I don’t get out to many birding festivals but I nonetheless know a good time when I experience it. Everything about this symposium from the setting to the participants to the presentations to even the birds (more on that in a moment) coalesced into a truly memorable event. Much respect is due to Bill Thompson III and the rest of the Thompson family, the staff of Bird Watcher’s Digest, volunteers from the Ohio Ornithological Society, and the representatives from the Lakeside Association and assorted local venues. As far as I can tell, three factors determine the success of a birding festival. The first is the location. I had low expectations for Lakeside because, hey, it’s in Ohio and anyway I live on the adjacent Great Lake. However, in my ignorance, I never considered why so many gifted birders from BT3 and the lovely Julie Zickefoose to Kenn and Kim Kaufmann choose to call the Buckeye State home. This place is both beautiful and birdy. While birding was surprisingly low on my list of priorities, I still managed two life birds in an area much like the one I call home. How did that happen? 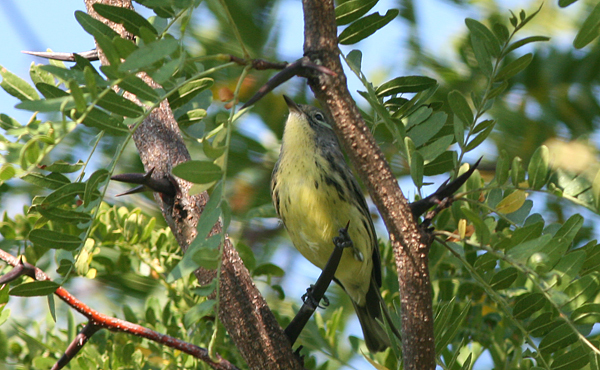 My first lifer was a total bonus bird, an unanticipated Kirtland’s Warbler at East Harbor State Park. This solitary warbler commanded the attention of a literal army of avian observers; most every attendee made at least one trip to spot it. My first foray with Mike Freiberg of Nikon and Ben Lizdas of Eagle Optics fell flat but the second with Jeff Gordon struck gold! Other sweet species at East Harbor included Philadelphia Vireo and Nashville and Magnolia Warbler as well as a Cooper’s Hawk which made songbird spotting rather difficult. My second life bird for the trip was nothing less than a stroke of serendipity. Birdchick and I brought our friend Hugo, the greatest guide in Guatemala, to Ottawa National Wildlife Refuge for some behind the scenes shorebird banding. This was not only my first shorebird banding experience but actually my first time ever seeing birds banded. Tom Bartlett and his partner clearly knew what they were doing and it didn’t hurt that folks like Paul Baicich and Alvaro Jaramillo were on the scene. The nets captured Wison’s Snipe, Semipalmated Plover, and Least, Semipalmated, and Pectoral Sandpipers while we were there. However, those weren’t new to me. That sighting occurred when Tom took me, Sharon, and Arthur Morris out to check the nets. As we clambered out of the back of Tom’s compact car, I spied a distinctive shorebird at the distant end of the mudflats. “Arthur, isn’t that a Buff-bellied Sandpiper?” I asked hopefully. Alas, Art didn’t have his bins! But a buff-bellied sand looks like nothing else in its range and received further confirmation when another group spotted it after it had flown off. Score! Believe it or not, the birds were low on my list of MBS priorities. My official role at the symposium was to promote birding and nature blogs as an heretofore untapped source of amazing content. First I gave a well-attended presentation titled “Around the World in 80 Blogs” focusing on many of my favorite nature blogs from different parts of the United States and the wider world. The next day found Sharon and I putting on a liveblogging display at the vendor area; Heather of the Hills has a great photo of me at the blogging table. I’m encouraged by the interest so many birders showed in blogs so if you’re blogging out there in the wilderness, keep at it… your potential audience is growing! Catching up with old friends and meeting new ones was the best part of the MBS for me. I loved spending time with the aforementioned bloggers along with my buds Clay Taylor of Swarovski Optik, Marci of the Rio Grande Birding Festival (coming Nov 2009! ), Lisa and Katrina of Houghton Mifflin Harcourt, Robert of Princeton University Press, and friends from Operador Latino and Guatemala Nature Tours. My pals Jen Sauter and Jim McCormac of the OOS were essential to the success of the event but still had time to hang out. I’d also like to note that this was my first time meeting Kenn and Kim Kaufmann and I was taken aback at how charming and friendly both of them are. I’m already looking forward to the The Biggest Week in American Birding in NW Ohio from May 7-16, 2010! I’ll end the name dropping of fancy birds and birders alike to give a final shout out to all the new friends I made, the bloggers, field guides, and industry experts that create the nucleus of the national birding community. Birders like these really make birding fun. Sometimes one needs to visit a festival like the MBS to learn this, which is why I recommend the experience highly. The Midwest Birding Symposium was such a success on so many levels that I can hardly wait two years for the next one. 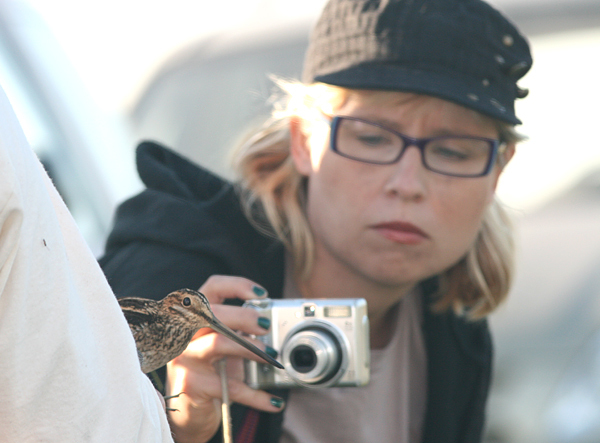 I love the photo of Sharon photographing that snipe – intense focus from her and slight bewilderment in the eyes of the snipe! Banding is very interesting to me. I may look into it more seriously in the future. I don’t suppose any of the blogging talks are in synopsis or review form online anywhere for those of us miles from these symposiums? Good question, Tai. In fact, many of the presentations, my own included, were recorded and will be available in a couple of weeks. Check in at the MBS site for details. Color me jealous. Not only of the Kirtland’s, though that would be enough, but also of the fact that there’s apparently no fancy birder attended Southeast Birding Symposium for me to attend! First I’d heard of the Biggest Week, and it’s just down the road from here. Definitely going on the calendar! Thanks Mike – I will check them out. Nate, if you start a Southeast Birding Symposium I’d be happy to attend! The symposium seems like a great idea, much different than a “normal” birding festival. 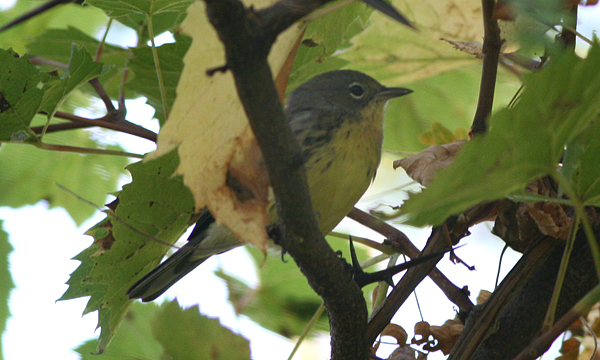 But still with great birds (Kirtland’s!!!!). Hopefully, I’ll be able to attend one sometime. Great pic of the Birdchick… a surprisingly serious and focused view! Poor me… (!) I had to go to Cape May this weekend instead. Hard to imagine there’s any *good* birds in Ohio… ever. Great post, Mike, and it was terrific having you in the house! I think we’re all looking forward to Midwest Birding Symposium 2011, which will be even bigger and better! Good seeing you again, and catching up a bit! As you know from my “close encounters” post, a large part of the symposium for me was about the people. Meeting people and just being around so many folks who love birds. I’m glad you got to experience Ohio birding, and that your opinion of birding in Ohio was changed by this event. Another added benefit of the symposium – assumptions debunked! Congrats on your lifers… I didn’t see either of those birds, but I got quite a few lifers myself during the weekend, some of which I’ll mention in a future post. Oh, and thanks for mentioning the Biggest Weeekend… I’m sure that area of Ohio will be hoppin’ with birders once again for the whole of May. That was quite a weekend, wasn’t it? Though the birds are always a major attraction, I’ve always thought the very best reason to attend events like MBS is the chance to meet so many interesting people, make connections, and share ideas. The birds, to some extent, are gravy. But any gravy that includes Kirtland’s Warbler and Buff-breasted Sandpiper, I mean, that’s some pretty fine gravy. Not literally, of course–you know what I mean. Looking forward to the next time our paths cross!